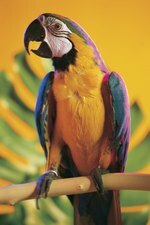 Sun conures, a smaller breed of parrot, are sexually mature at the age of 2 and can begin breeding. After the initial breeding, the birds will continue to breed at least once per year. When planning to breed sun conures, it's important to place a nesting box inside the cage of the female bird. The nesting box acts as the bird's nest and is where it will lay and care for the eggs until they hatch. Making a sun conure nesting box is an easy weekend project. Select a large box made of wood or other durable material. The box should be approximately 8 inches by 8 inches by 12 inches, and have a removable lid. Use a knife or saw to cut a round, 3-inch-diameter hole into the side of the box. This is the entrance that the bird will use to go into the nesting box. Cut an additional round hole in the top lid of the box that is approximately 4 inches in diameter. This is an observation hole which allows you to monitor the eggs without disturbing the bird. Place a 2-inch layer of sawdust, shredded newspaper, straw or wood chips into the bottom of the nesting box. Attach the nesting box in an elevated position near the top of the cage using wire. Wrap a 12- to 18-inch piece of wire around the box and through the cage wire. Twist the wire to secure it tightly. Repeat with two to three additional pieces of wire to secure the nesting box.